It's hard to imagine a meet that can run faster than Woodbridge, but if such a thing exists then the Dana Hills Invitational might qualify. The course is flat and fast, with a few stretches on the track, and the competition is strong enough to push runners to outstanding performances. Although the meet follows a grade-year race structure and is divided into 3 divisions by school size, which separates a lot of the runners, there is an Invitational Section that is run within the D1 Senior races. We can hope that most of the top runners will opt to get there early for that race, because otherwise we will need to wait for combined results to really get a full sense of what we can learn from the meet. We'll be on-site with photo and video coverage! Check back Saturday night and Sunday for updates! Start with the top returner from the 2015 edition of this meet, Jack Landgraf (Dana Hills). In many ways that was his breakout performance, as he clocked a lightning-fast 14:28.40 that announced his presence as an individual contender at the state level. His primary competition for the individual title could come from Jacob Smith (Pacifica Garden Grove), who clocked 14:35.90 last weekend at Woodbridge. There are several contenders for "breakout" status this year, whether they run together in the Division 1 Senior race (which is the Invitational section) or whether they run separately. 7 guys have broken 15 minutes this season at either Woodbridge or the Great Cow Run, which should be very comparable to this race. That list includes Gio Orellana (Brea Olinda) and Jhavahn Houston (Serrano) as well as San Juan Hills sophomores Daniel White and Jacob Aries. Dana Hills traveled to Utah last weekend to compete in the Pleasant Grove Viking Invitational. The results were mixed. The Dolphins lost big US #1 American Fork as well as regular Utah power Lone Peak, which is understandable. They also raced even with lesser-known Stansbury and Pleasant Grove, which is probably not the result the team was looking for. It's possible Dana Hills wasn't a full strength, though, and that's why this weekend's meet could give us a lot more information about the team. Teams like Brea Olinda, Sage Creek, and Mission Viejo are sort of in the same boat as the host school, in that they are still trying to hit full stride and prove themselves. Claremont is signed up, but their top 7 are heading to Minnesota for Roy Griak. I have a feeling that when we combine the results of all the separate grade-level and division races, we might get a few surprises! San Juan Hills and Canyon (Anaheim Hills) could be sleeper teams to compete very well here. The top returners from the 2015 Dana Hills Invitational aren't attending this year, which leaves Laura Horan (Mt. Carmel) as the best girl back after clocking 17:39.90 last year. 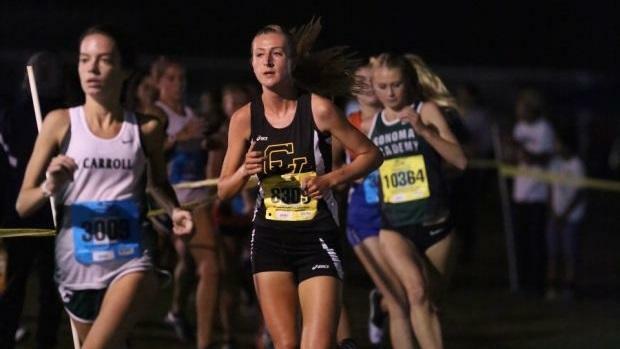 She should be pushed for top overall honors by Haley Herberg (Capistrano Valley), who had an excellent performance at Woodbridge last weekend that may have been overlooked by some. Expect Sara Leonard (Canyon) to be in the mix, too, especially since it looks like she will run with the D1 Seniors in the Invitational section. Skyler Wallace (Sage Creek) is one of the top freshmen in the state so far this year, and she has a chance to post a big time on this fast course. Claremont would be the team to beat, but we expect their top 7 to be at the Roy Griak Invitational this weekend. That means longtime foes Serrano and Capistrano Valley should be battling Canyon (Anaheim Hills) for the top spot in the combined results. I'm really looking forward to seeing how Long Beach Poly races this weekend; the Jackrabbits had a solid performance at Woodbridge, but I suspect they hoped for a bit more success, and that could be fuel for big times this week.